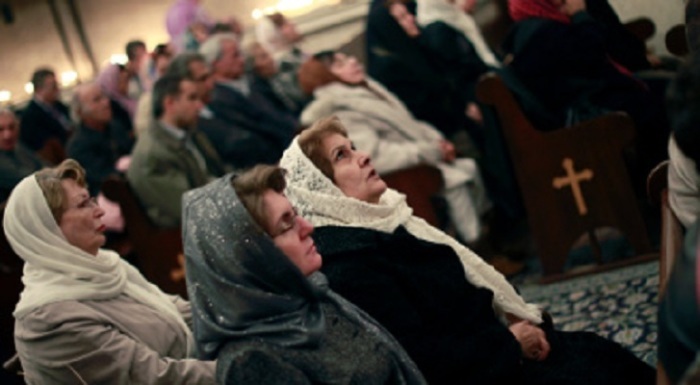 The Iranian government labels Christianity as a threat to the nation's Islamic identity and imprisons over 100 Christians for worshiping Christ. Such crackdowns on faith, however, have not prevented Iranian house churches from blossoming into a movement too big for the Iranian religious police to contain. Some estimates, such as one provided by Open Doors USA, record as many as 450,000 practicing Christians in Iran, while other, more optimistic estimates, record over 1 million Christians in the Islamic republic. Regardless of the number, there is a strong need for leaders-in-Christ who can lead individual house churches and help the movement grow to become not just a Christian movement, but also an inherently "Iranian" one. At least 200 Iranian Christians are being trained by the London-based Pars Theological Centre to become the next generation of leaders to help the house church movement grow so that it can foster a better society for all in Iran, a source affiliated with the centre told The Christian Post. "Pars sees this as a real chance to train agents of change who would transform the Iranian society from the bottom up by fostering a grassroots development of the values of Jesus in an Iranian style," the source stated. "This is not a political movement at all, but it will have political implications because it is touching the core foundations of society. This is battling prostitution and drug addiction. If you want to live in a country that doesn't fund terrorists, you have to develop the values of the grassroots." "It is not anti-Iranian," the source assured. "It's an Iranian movement. It's a great, great number of Muslims turning to Christ." The source explained that due to the fear of government crackdown, Iranian house churches consist only of about four to five members, and have to change their place of gathering every time they meet. "If they want to sing, they have to sing very quietly or not sing at all," the source explained. Pars Theological Centre, which was founded by Rev. Mehrdad Fatehi in 2010, works closely with several Iranian house church networks. About 70 percent of Pars' students live in Iran and are trained within the country. Candidates who study with Pars are mostly accepted by the recommendation of their leaders. Pars is intentional in targeting its students' hearts, hands and minds in all its courses. In addition, Pars has also developed a ministry program where the students are put under the care of a mentor who guides them in their spiritual journey and practical ministry. Pars' program, if studied full time, can take one, two, or three years to complete, but most students don't have the time to complete it in that time frame. Students are taught various Christian themes and concepts in courses, such as The Suffering Church, Hermeneutics, Christian Counseling, Ministry and Teaching of Jesus, Christian Ethics, The Triune God, and Apologetics. A major part of the learning is done from within the students' homes on offline computers, using Pars' video lectures, workbooks, and resources in a digital format. The students stay in touch with their teachers and tutors through email. This allows them to submit their assignments and receive feedback on a regular basis. Pars additionally broadcasts courses through two satellite channels into Iran, which are watched by thousands of Iranians, Christian and others. The students sometimes gather in small groups to talk about the content of the lessons, the source added. In each group, a senior student leads the discussion. "These are all underground, and the students need to keep extreme security measures," the source said. "They have times of worship and prayer, but these need to be done very quietly and without attracting attention." While most of the study is done in Iran, students can also attend Pars' formation conferences that are held in other countries. These are the only times the students get to actually meet their teachers in person, and pray and have fellowship with them. Though it took only about three years for the center to grow its student body to over 200, Pars has the goal of one day training as many as 1,000 Iranian leaders. "While Iran's fast church growth is a cause for celebration, there is serious concern for the lack of depth in the movement and the severe shortage of well-equipped leaders to address this need. The church is facing a leadership crisis that, if not addressed, will damage its health and mission," the source contended. "So there is a great and urgent need for training quality leaders, and to do that there needs to be quality theological and leadership training that is accessible to those who are serving inside the country." Although there are well over 200 emerging Christian leaders in Iran who want to train with Pars, the center needs more human and financial resources to be able to accommodate more students. Along with those who are studying from inside Iran, Pars also trains Iranian Christians from over 17 countries. Donations to Pars Theological Centre can be made by clicking here.